Yes, you really can build anything with Lego. Here we have the Easter Bunny created from an inexpensive kit supplied as part of Lego's BrickHeadz range. Very simple to build, the final model features large movable ears and the bunny's cuteness factor is intensified with a glint in its decorated eyes. This little LEGO Brickheadz Seasonal 40271 Bunny No. 30 character stands four inches (12cm) tall without his baseplate and is best regarded as a display item, rather than a set for regular play with children. This visual aspect is enhanced by the inclusion of a bucket and carrot to complete this little bunny's Easter credentials and the inclusion of parts to build two Easter eggs and seasonal flowers. 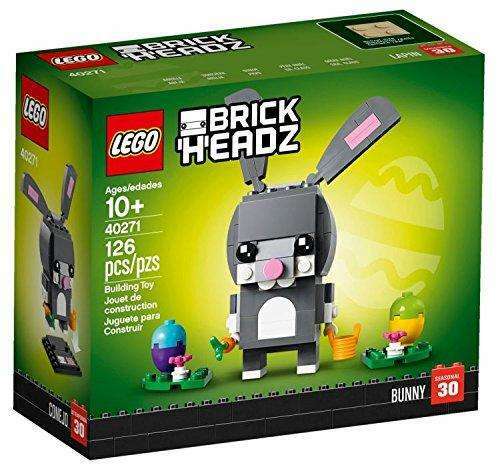 Overall, this seasonal LEGO Brickheadz Seasonal 40271 Bunny No. 30 set is a lovely addition to the Lego range and widens its appeal to include a younger female audience.